Nameplates, such as those that appear over players and named mobs, appear angled when not viewed straight-on. This is harmful to legibility, especially when lots of nameplates are visible or the player or source is moving. The nameplate will appear to be "warped," which looks unnatural. Nameplates can be distorted in a number of ways, including being tilted or stretched such that the sides appear to be of uneven lengths. When rendering a nameplate, they should draw exactly parallel to the screen as perfect rectangles, only scaling based on distance. Billboarding does this for dropped item entities, for example, and nameplates should work the same way. The behavior can be contrasted with Java Edition. Regardless of the angle of viewing, nameplates draw parallel on the screen, never rotated or distorted. Attached are several comparison screenshots. This also affects particles. 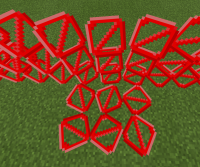 While some particles (such as falling sand residue) rotate naturally, all particles fall victim to rotating or warping themselves unnaturally based on the view angle. Again, this is rather distracting if you're not used to it, and gives the illusion of movement on particles that should be still. It's as if they're trying to billboard to the screen, but aren't. Like nameplates, particles should draw exactly on the client's screen, scaling with size but never being distorted by the perspective of the view angle.